for palladium to 2.4% for platinum. Gold and silver each moved up 2.1%. Precious metals futures rallied Wednesday in the aftermath of a higher than expected reading on U.S. inflation. Gold notched its third straight advance and settled at a three-week high. Gold for April delivery tacked on $27.60, or 2.1%, to settle at $1,358 an ounce on the Comex division of the New York Mercantile Exchange. The close was the strongest since Jan. 25. "The big U.S. economic report of the week on Wednesday saw the consumer price index report come in hotter than expected," Jim Wyckoff, a senior analyst at Kitco Metals Inc., said in a report. "The CPI report falls into the camp of the U.S. monetary policy hawks, who would like to see the Federal Reserve raise interest rates at a faster pace: likely four small increases in 2018," Wyckoff added. Early Wednesday, the U.S. Labor Department said consumer prices increased 0.5% in January, topping expectations. 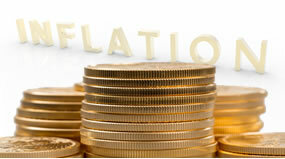 The CPI showed wide pricing gains. Gold futures ranged from a low of $1,319.10 to a high of $1,358.60. They rose 0.3% in the previous session and climbed 0.8% on Monday. Silver for March delivery jumped 35 cents, or 2.1%, to settle at $16.878 an ounce. Silver futures traded between $16.32 and $16.91. They shed 0.3% on Tuesday and rallied 2.7% on Monday. April platinum added $23.40, or 2.4%, to $999.10 an ounce, ranging from $971.20 to $1,002.20. Palladium for March delivery rose $16.60, or 1.7%, to $997.30 an ounce, trading between $973.05 and $999.75. Gold gained $10.90, or 0.8%, to $1,336.25 an ounce. Silver declined 2.5 cents, or 0.2%, to $16.58 an ounce. United States Mint bullion sales advanced by 25,000 ounces in American Silver Eagles and by 2,500 ounces in American Platinum Eagles. 2018-dated Platinum Eagles debuted on Monday, Feb. 12. Their sales now total 20,000 coins, matching the mintages in years 2016 and 2017. Futures indeed, yes, but whose future?